A photo collage is a collection of pictures that you put up together in an artistic style. While its much easier to create a collage with printed pictures and office paste, its not much harder to do with digital pictures. You do not need expensive software like Adobe Photoshop for creating the photo collage; neither do you need to go to college and attend some boring lectures to learn about photo editing skills. All you need is a free software called CollageIt. It can take your pictures and randomly put them together on a page creating the photo collage for you. It also lets you adjust other minor details like page border, spacing between pictures and the layout of the collage. When you launch the CollageIt software it shows you a gallery of photo collage templates and you can choose any one them. All these templates have different styles, borders, rotations background colors etc. There are total fifteen templates to be chosen from. 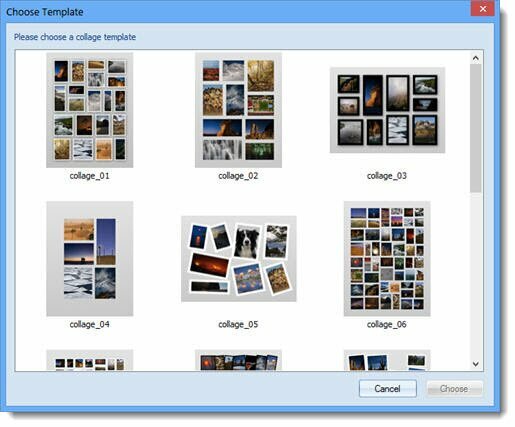 After you select a template click on the Choose button to open the main CollageIt window. In the main CollageIt window, you can drag-and-drop your picture files that you want to create the collage from. The program would immediately create the collage from the dropped image files. If you do not like the selected template, then you can select another one by clicking on the Choose Template button. You can click on the Shuffle button to re-order the pictures and create a new collage. You can also click on the Random Layout button to randomly select a layout for your collage. These functions are very useful if you want to try different styles of collages created from the same set of pictures. From other settings for your collage, you can choose the rotation angle for your pictures, sparsing for the picture (the distance between two pictures), number of photos in a collage, space and margin between pictures, shadows and frames for the pictures etc. When you are finished with creating the collage, you can click on the Export button to export it into an image, send it to someone through email, set it as your desktop wallpaper, post it on Flickr or share it with friends on Facebook. The CollageIt collage creator software is easy to use for users of all levels – from beginners to advanced user. You can create impressive looking photo collages with this simple to use software. Using CollageIt you can create stunning photo collages for special occasions like Valentine’s day, wedding anniversaries, mother’s day, father’s day etc., print them on paper and present them to your dear ones. How do you get to the giveaway? nothing links to the pro version mentioned above. Only the free version is downloadable. Any hints appreciated. They ask that you share the promotion (Facebook, Twitter, Reddit, etc.) in order to get the Pro for free. Great deal! The Pro removes the watermark that the free version includes.